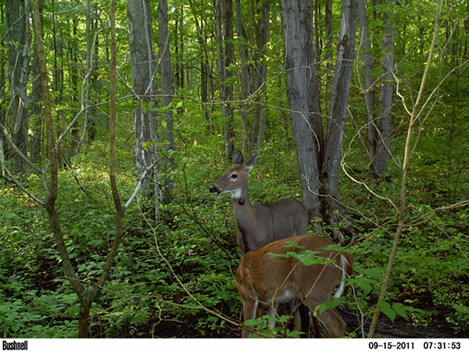 Trail cameras are an increasingly popular method of gaining information about the presence, population composition, activities, health and interactions of a variety of wildlife species. 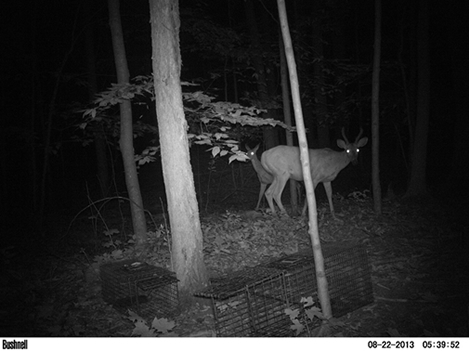 As digital photographic technology has become both more sophisticated and less expensive, the use of trail cameras has become feasible, for individual users and for larger projects. Typically, these cameras are securely mounted in an inconspicuous location that provides an unrestricted view of an area of interest. 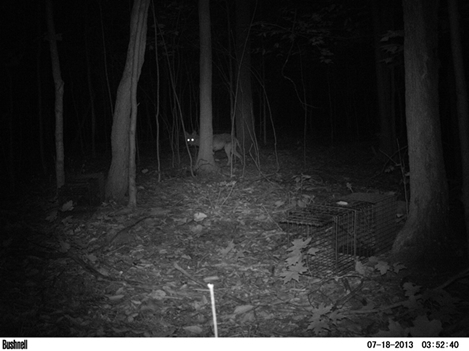 The camera’s shutter is activated by motion and will thus take a photograph of any wild animal whose presence triggers it. A variety of camera types are available, and some are capable of night-time photography as well. As technology has improved, it has become possible for cameras to store more images and stay active in the field for longer periods of time. The availability of this sort of technology has opened the way for some large and ambitious citizen-science project. One of these is Snapshot Serengeti (http://www.snapshotserengeti.org/#/home) in which 225 cameras have been set up in Serengeti National Park, with the aim of capturing information on both the carnivores and herbivores that are present there. This number of cameras produces a huge volume of images and the project uses volunteers from around the world to view and classify the images. 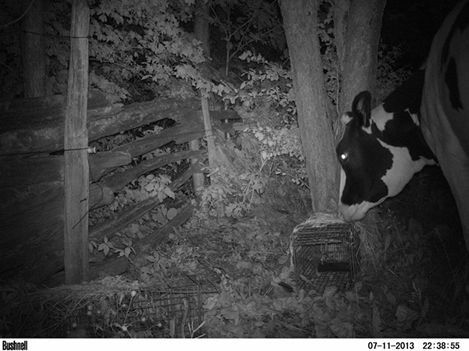 This project inspired a North American project funded by the Department of Natural Resources in Wisconsin (http://dnr.wi.gov/topic/wildlifehabitat/research/citizenMonitoring.html). This project intends to purchase and distribute more than 3,000 trail cameras to be distributed around the state and will use a similar method of citizen science to classify and analyse the images produced. These projects are massive undertakings, and trail cameras are more commonly used on a more modest scale, either by an individual landowner or scientist, looking for better information on a local scale.Kristin Bondo, a Ph.D. candidate at the University of Guelph under the supervision of the CCWHC’s Ontario/Nunavut Regional Director, Dr. Claire Jardine, is conducting a field study to determine the role of raccoons and skunks in maintaining and disseminating antimicrobial resistant enteric bacteria (e.g. Salmonella, E. coli, and Campylobacter) on swine farms and conservation areas in southern Ontario. Antimicrobial resistance is a threat to global health, and the role of wildlife in the epidemiology of antimicrobial resistance is unknown. 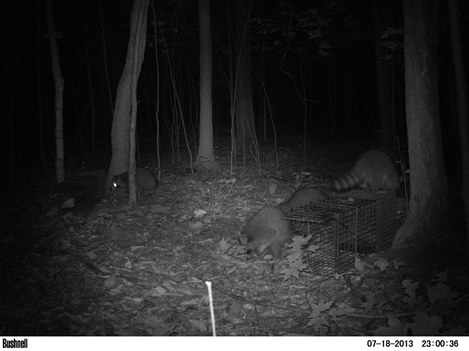 The camera also provides information on other species of wildlife that are present, some of whom also explore the traps. Not all of the visitors are wild animals. 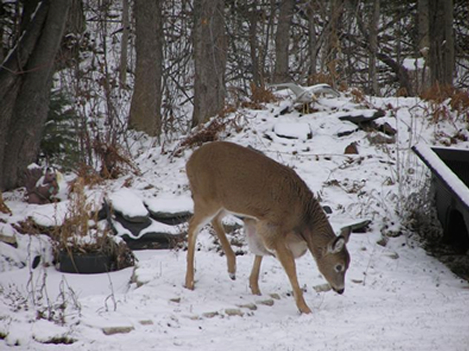 Photos of this sort provide evidence of how contact between wild and domestic animals may occur, sometimes with the potential for transmission of disease. 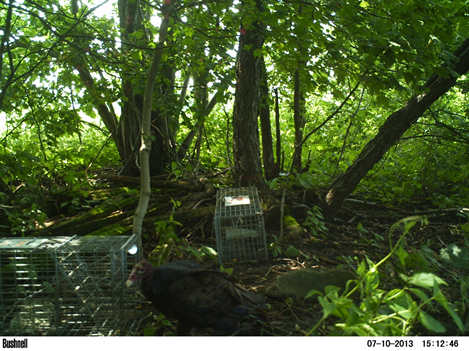 Trail cameras have also become popular with hunters, who use them to monitor for the presence of game species in their area. 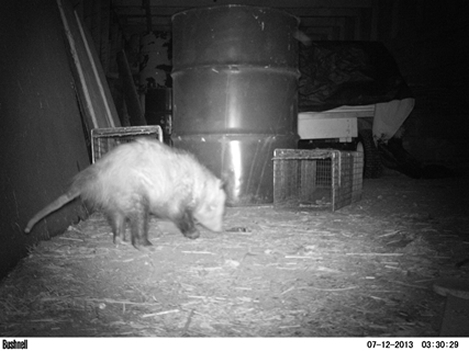 Sometimes, the images obtained show evidence of disease, and the photos are sent to a wildlife agency or the CCWHC for assessment of the condition. As this technology becomes more affordable and widely available, the potential exists to amass a great deal of information on the presence, habits and interactions of wildlife species. However, some greater structure and purpose will also be necessary in order to make the resulting information scientifically valid and useable.